James sets off with many of the local tenants with him. Word comes back from the sole survivor that all were killed at Culloden. The old Laird is reluctant to lose Alison’s inheritance, so necessary for the upkeep of the property & encourages Henry to marry her. Both are reluctant. Alison because she loves James & Henry because he loves Alison but knows she doesn’t return his feelings. The locals, meanwhile, have forgotten all the Master’s wicked ways & turn against Henry, blaming him for staying at home while his brave brother. The Master’s return begins a period of misery for Henry. The Master is now known as Mr Bally because, as an exiled Jacobite, he could be arrested & tried for treason if he’s caught by the King’s men. Henry is compelled to provide his brother with money that he can ill afford to take out of the estate & the economies he is forced to make get him a reputation as a miser because he will not tell his father & Alison the truth. The Master persecutes Henry in other ways, by being pleasant & kindly in company & cutting & dismissive when he & Henry are alone which make Henry look surly & ungracious when the whole family are together. He had laid aside even his cutting English accent, and spoke with the kindly Scots tongue, that set a value on affectionate words; and though his manners had a graceful elegance mighty foreign to our ways at Durrisdeer, it was still a homely courtliness, that did not shame but flattered us. All that he did throughout the meal, indeed, drinking wine with me with a notable respect, turning about for a pleasant word with John, fondling his father’s hand, breaking into little merry tales of his adventures … that I could scarce wonder if my lord and Mrs Henry sat about the board with radiant faces, or if John waited behind with dropping tears. The Master also ingratiates himself with Alison & little Katherine, Henry & Alison’s daughter. The old Lord can, of course, see no wrong in his eldest son. Mackellar is often a witness to this because Henry has had to take him into his confidence. Mackellar hates the Master & makes a formidable enemy of him when he refuses to drive off Jessie Broun, the young woman who has borne the Master’s child & hangs around Durrisdeer wanting to speak to him. Henry & Alison’s estrangement grows & they barely see or speak to each other except at meals. Mackellar begins to suspect that the Master is not in such danger as he asserts & Henry discovers that Mr Bally is, in fact, in no danger at all & is a Government spy to boot. However, even after Henry exposes him to their father as a liar, the old man makes excuses for his favourite & rejoices that he is in no danger rather than reproach him for the lies. The ill feeling between the brothers comes to a head on the night of February 27th 1757. As they play at cards late at night, the Master taunts Henry with his influence over Alison & says that she has always loved him & loves him still. Henry strikes his brother & this leads to a duel which takes place in the long shrubbery behind the house. The Master tries to grab Henry’s sword (against the rules of the duel) & is stabbed as a result. Henry & Mackellar think him dead & return to the house. When Mackellar goes back to the shrubbery to retrieve the body, the Master has disappeared. Henry falls very ill & Mackellar & Alison nurse him through a desperate fever. Henry recovers from his illness but he is marked by it. He is devastated by the thought that he killed his brother & even when Mackellar tells him of the Master’s disappearance, he is not really comforted as he knows that they will meet again. Even as Henry recovers, his father sickens & dies of a brain fever. Some months later, a son, Alexander, is born, & Henry begins to revive as he makes plans for the boy’s future. Oooo, your review makes it sound fascinating! I was a little put off Stevenson, after reading The Black Arrow, but I will definitely put this one on my list. Thanks! 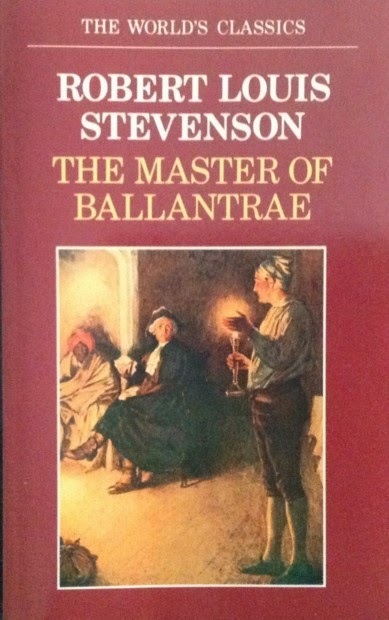 I always enjoy RLS's Scottish stories most & he certainly created a wonderful character in the Master.